Nokia 800 and Acer M310 are two new gems which are discovered by Elbert Perez who is a Windows Phone game developer. When he was looking for the device which could support his game then he found two Windows Phone 7 devices Nokia 800 and Acer M310. So there is a possibility that Nokia and Acer are working on some more Windows devices. However, this new leak prompts more questions in our mind. 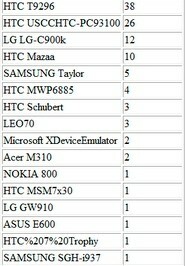 Nokia 800 and Acer M310 are new devices or these are only the new name of Nokia Sea Ray and Acer W4? can we assume these are close to production? No source which highlights the details specs of both WP7 devices. So you have to wait and watch for getting more info.